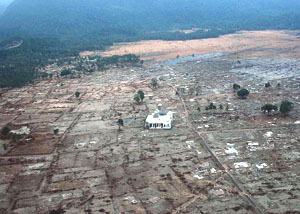 A catastrophic earthquake and tsunami that took place in Southeast Asia on December 26, 2004 greatly influenced the dynamics of civil conflict in Aceh province. Causing horrendous damages in Aceh province, the tsunami proved to be an impetus to peaceful resolution of the civil conflict. This case study presents analysis of the effects of natural disaster on reconciliation of the conflict between the rebels of the Free Aceh Movement (GAM) and Indonesian government that has been going on since 1976. The Indian Ocean tsunami on December 26, 2004, dubbed "Boxing Day" Tsunami, resulted in death of 130,000 Acehnese and displacement of 400,000 others. At the same time, it provided an opportunity to establish peace in a war-torn province. Because of the unprecedented scale of devastation and the dire need for help, the necessity for international aid to reach the province prevailed over political interests. Although the tsunami did not fundamentally change social dynamics of the conflict, since neither the Indonesian military, nor the rebels incurred any significant people losses in the immediate aftermath of the disaster, people's mentalities changed irrevocably. Mostly women and children perished in the dark waters of Indian Ocean. The population of Banda Aceh, the hardest hit area, consisted chiefly of young people, with 50 percent younger than 15 years old. At the same time, according to the study conducted by Flower Aceh, a local NGO, fewer women survived the catastrophe then men. The ratios are staggering, in one case 40 women survived in comparison with 750 men. Traditions of wearing long layered clothing and their general role in society as main caregivers were some of the reasons that women were less equipped to survive, the study suggests. 2 Because of the long traditional clothing women could not run as freely or swim. As a result, a great number of men were left with motherless children, and being unfamiliar with performing such household tasks as cooking or washing clothes, had to adjust quickly. 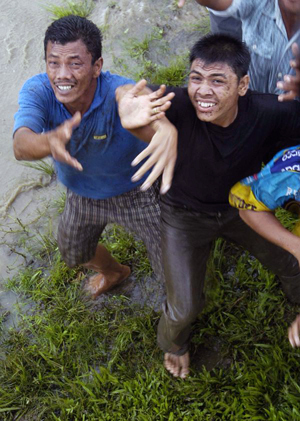 The post-tsunami situation in Aceh required an immediate response from the government to provide help in searching for survivors, burring bodies, providing water, food, and shelter for the survivors. Indonesian government turned to the military to execute the rescue and relief operations. Nevertheless, the government did not order the military to abort the continuing search for rebels. The government stance on issue of GAM after the tsunami resulted in unnecessary deaths among civilians, who had learned to mistrust the military over the years. People in Aceh province have had to live with an ongoing conflict between GAM and Indonesian military for thirty years. During this time, many had lost their lives in the gunfight between the rebels and security forces. By some estimates, over 15,000 Acehnese had died during the conflict, predominantly civilians. The exact numbers remain unknown, since the province has been off limits to international monitoring organizations for years of military rule. What had begun as a struggle for independence in 1976 evolved into a fight for the control over natural resources revenues. Both sides pursued both political and economic goals, since the proliferation of the conflict ensured steady flow of money from the sale of arms, illegal drugs, and extortion. Many previous attempts at reconciling of the conflict were unsuccessful, due to a number of reasons. Firstly, the tensions between the local population and migrants, who moved into the region following lucrative jobs at the oil and gas facilities, escalated due to economic crisis. Secondly, military's violence against Acehnese added supporters to the GAM. The Indian Ocean tsunami pushed both conflicting sides to dispute resolution. International media rushed into the region to bring the latest, most shocking news to people worldwide. Such scrutiny revealed the atrocities taking place in Aceh province, presenting Indonesian military and government in an unfavorable light. Being in extremely vulnerable position and in need of international help, Indonesian government reassessed the situation and resumed peace negotiations with leaders of the GAM. On August 15, 2005, after several months of negotiation, a peace agreement, dubbed memorandum of understanding”, was signed in Helsinki , Finland (See the Photogallery of signing of the agreement). The Memorandum of understanding prescribes implementation of two stages of agreement (1) initial monitoring presence (IMP) and (2) Aceh monitoring mission (AMM) which started September 15. The AMM is conducted by EU monitors together with representatives from Norway and Switzerland and contributing countries from ASEAN ( Brunei, Malaysia, Philippines, Singapore and Thailand ). The rebels handed over a quarter of their weapons (approximately 210) on Thursday, September 15, 2005. After the verification of weapons destructions the military withdrew 25 percent of troops. Over 200 European and Southeast Asian monitors are going to supervise the process of demilitarization in Aceh, which would ultimately include withdrawal of a vast majority of Indonesian military and police from the territory. Despite previous failures to achieve an agreement on peaceful resolution of the conflict, the Indonesian government and international community are optimistic that this historic agreement would bring an end to the conflict. The Aceh/Sumatra Liberation Front (ASNLF), the precursor of GAM, declares independence from Indonesia on December 4, 1976. Memorandum of Understanding between the Government of Indonesia and the Free Aceh Movement had been signed on August 15, 2005. Free Aceh Movement (Gerakan Aceh Merdeka, or GAM)- the rebel group founded in 1976. Indonesian military (TNI), TNI General Endriartono Sutarto. International Community: EU observers, ASEAN monitors, Aid organizations. 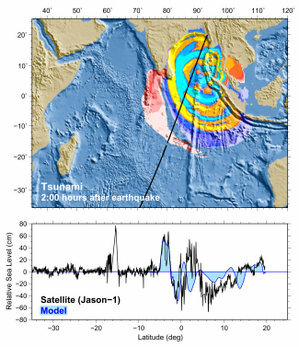 Radar imaging of the tsunami two hours after the earthquake. This image is a work of the National Oceanic and Atmospheric Administration, taken or made during the course of an employee's official duties. 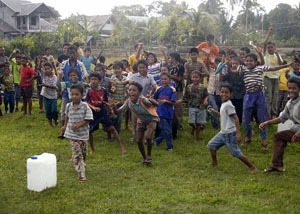 The impact of environment on Aceh conflict proved to be tremendous. Like in many other cases, environmental factors played a role of catalyst, resulting in both negative and positive outcomes. 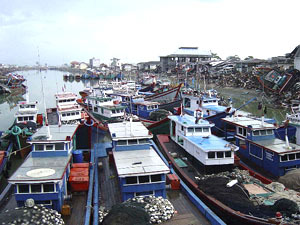 While the dispute over proceeds of natural resources revenues exacerbated hostilities between Aceh people and Indonesian government, the tsunami tragedy alleviated tension and forced both conflicting parties to compromise. Whereas in the first instance, abundance of mineral resources had an indirect effect on ongoing conflict, the case of tsunami presents a situation where its' consequences resulted in a significant change of direction of the conflict. On December 26, 2004 an earthquake (9 on Richter scale) shook Indonesia . Its' epicenter was less than a 100 miles away from the northernmost part of the province of Aceh . 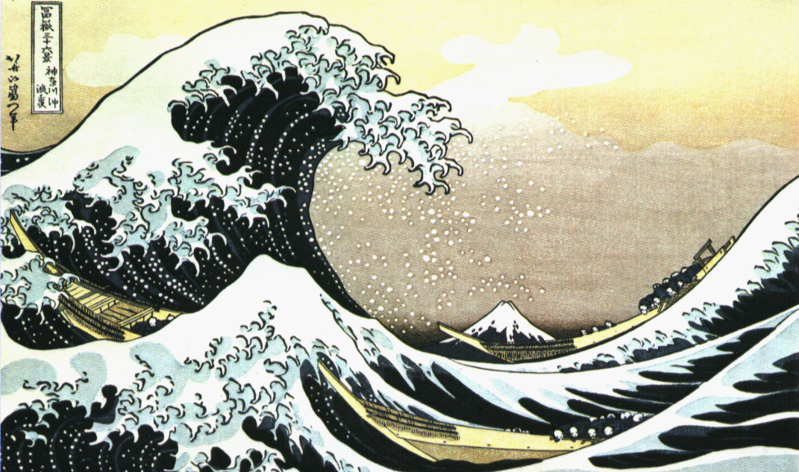 As a result, the gigantic waves it caused turned into tsunami ensuing colossal damages to the coastal areas. Neither the media, nor the authorities warned citizens of upcoming earthquake and tsunami. Tsunami warning system simply did not exist in South Asia to alert people living in these areas. As a result, eleven countries were affected and thousands of people vanished into the ocean (around 300,000). The impact of the earthquake and tsunami on Acehnese habitat was manifold: the villages were destroyed, previously arable lands got polluted by the seawater (causing salinization), fisheries were demolished, coral reefs and beaches washed away; roads, houses, hospitals, schools were wiped out. Since the GAM's stronghold was mountainous terrain, the rebels did not incur significant losses in their midst. Indonesian military suffered some losses, but it is ordinary civilians who had to bear the brunt of the catastrophe. Around 120 thousand people were found dead and over 700 thousand became displaced. By the World Bank's estimates, the population affected by the disaster in Aceh is around 2.8 million people. Those who survived were experienced physical and psychological problems. Lack of sanitation, post-traumatic shock, losses of loved ones, and a sight of dead bodies exacerbated psychological trauma experienced by the tsunami victims. When earthquakes happen, as they do so often here, people frequently feel paralysis or numbing of the legs” says a medical expert, F. de Leval. Aceh's population health status had been the lowest in Indonesia even before the tsunami. 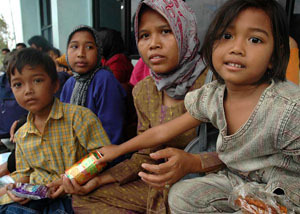 According to the World Bank report 9, the number of hospitals and doctors in Aceh presents 2% of Indonesian total. The medical personell is concentrated in cities and is unwilling to go to rural areas due to security concerns. After the disaster a threat of epidemic became an overriding concern to authorities and international health organizations. Due to the fact that the majority of roads in Aceh run near the coastal areas, they were destroyed by the waves, making it very difficult to reach places that were hit the most. Fisheries incurred the heaviest losses: boats were damaged; many fishermen were engulfed by the ocean; coastal villages destroyed. One of the psychological issues for the local fishermen to overcome was a fear of water. On the other hand, demand for fish plummeted, because many believed that it was poisoned after devouring human remains in the ocean. Others lost their taste for fish as another psychological side effect of the tsunami. As a result, fishing industry, which previously represented 7 percent of GDP and employed about 100,000 people was one of the hardest hit. If before the tsunami fish was a staple food for local population, afterwards many refused to consume it, further weakenning the industry. The Aceh conflict is civil; it can be characterized as strife between Indonesian government and rebel movement (GAM). On one side, rebels were determined to regain the province's sovereignty, which they believe was taken away from them in 1949 when the Republic of Indonesia was created. Their other goal was to reincarnate theocracy. On the other side, the Indonesian government wanted to continue to receive revenues from lucrative gas extraction operations that are situated on Aceh territory. The abundance of natural resources contributed greatly to conflict proliferation. Acehnese people's discontent associated with the usage and mishandling of natural resource, specifically, gas and oil, added complexity to already controversial dispute. Local grievances over disproportionate distributions of revenues from natural gas extraction combined with degradation of land fueled the conflict with new force in 1989. To curtail the spread of rebel movement, which became more agressive, Indonesian government declared Aceh an area of military operations” or Daerah Operasti Militar (DOM). The period of 1990-1998 was one of the most gruesome in history of the conflict resulting by some estimates in 2,000 to 10,000 deaths. Despicable acts of human rights violations conducted by Indonesian military shifted public opinion drastically in favor of GAM, filling its' ranks with new recruits and supporters. GAM has had three incarnations: the first in 1976-79, when it was small and ill-equipped, and was easily suppressed by the military; the second in 1989-91, when it was larger, better trained and equipped, and was only put down through harsh security measures; and the third beginning in 1999, when it became larger and better funded than ever before, challenging the Indonesian control of the province. During 30 years of guerilla war the GAM's membership grew from 150 to between 15,000 and 27,000 regular and irregular soldiers. It should be noted, however, that the rebels still lacked weapons, with one of five fighters having a rifle. The main actors of the conflict (GAM and its' supporters, Acehnese civilians, TNI, Indonesian government, multinational corporation Exxon Mobile, International organizations) had varied experiences of the conflict. For Acehnese, the deleterious impact of conflict on their everyday life is unquestionable: a large number of people was tortured and killed, others incarcerated; production was distracted, households abandoned their fertile lands; overall economic development of the province had stalled. At the same time, military insurgents had benefited from the conflict through arms sale to GAM, pillaging, and corruption. At the same time, Indonesian government had to increased its' spending on military because of its dependence on its' operations. Exxon incurred significant losses due to sabotage and personnel threats, while GAM enjoyed increased number of recruits and supporters, who provided funds and munitions. In 2000 the Aceh province was granted special autonomy and a larger revenue-sharing scheme. Aceh government was allowed to retain up to 70% of oil and gas revenues.9 However, because of the widespread mistrust of the government's policies and disbelief in successfull enforcement of these policies, the greivances of the population and the conflict did not abate. The conflict seemed to be self-perpetuating. Because the majority of weapons that belonged to the GAM were the same ones that were used by TNI, it was difficult to determine the guilty party in the conflict.10 As Human Rights Watch report emphasizes, "neither side appears to be serious about holding members of its respective forces accountable". Furthermore, "the army and police use troops out of uniform so they can avoid responsibility for abuses and put the blame on GAM. GAM reportedly sometimes sends members into action without uniform, so that if they are killed by the army, GAM can claim them as civilian victims. "10 Therefore, it would be unfair to pinpoint the "bad guys" in this case. As M. Ross suggests, GAMs tactics were usually intended to increase the support base and present the Indonesian government in a very unpleasant light. The Tsunami of December 26, 2004 brought hope to war-torn province. International community's desire to help victims of tsunami and Indonesia's desperate need of foreign funding put pressure on Indonesian government to put an end to dehumanizing conflict in Aceh. Fatality level of dispute approximate 15,000 dead, most of them civilians. Fatality level according to logarithmic level - 5. Recovery from the tsunami was complicated by the war between GAM and TNI. Many survivors had moved inland, to the hills, where they were closer to GAM fighters' hideouts. Since the Indonesian military had proved to be indiscriminate in treatment of Acehnese, suspecting all of them to be GAM sympathizers, victims of tsunami were now in danger of persecution from the TNI. The indiscriminate treatment was justified by the military due to the fact that often enough, it was one of the GAM's tactics where the fighters would wear civilian clothes and act as civilians. A few years before the tsunami stroke, Aceh province had been under martial law and unattainable for international organizations. The Indonesian government explained this state of affairs as a necessary precaution; in the meantime, trying to extinguish rebel movement, GAM. Despite the pressures coming from the West to stop the conflict and reach a peaceful agreement, the Indonesian government refused to recommence negotiations with GAM. 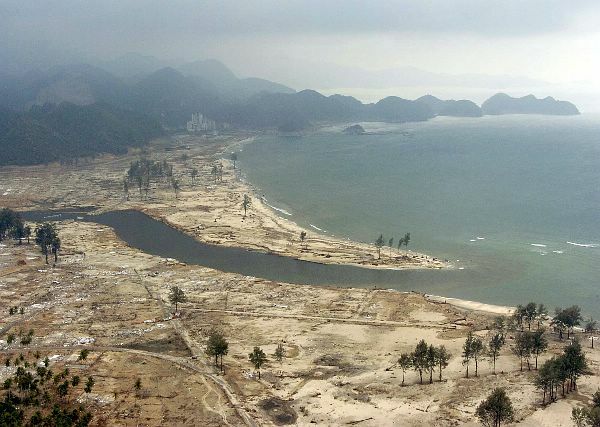 Even after the catastrophic tsunami, the army cordon was not removed from the worst-hit Aceh province, making it difficult for aid to reach the victims. Moreover, instead of concentrating their efforts on helping civilians, TNI continued their hunt for rebels. 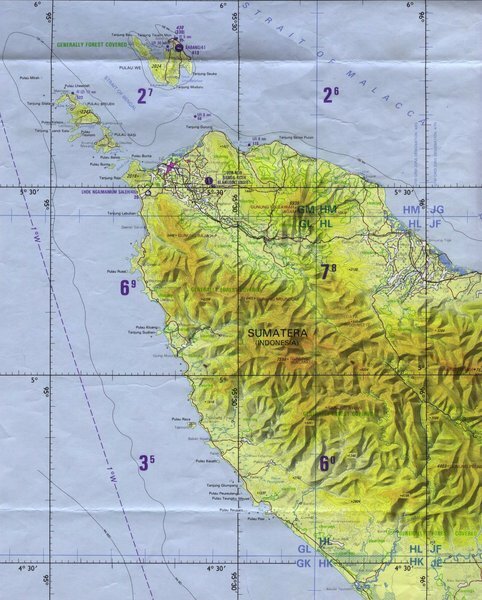 The tsunami disaster gave TNI an advantage in the continuous conflict with the GAM rebels. The Indonesian army was immediately put in charge of somewhat conflicting functions: humanitarian relief and security operations. As one of the army officials, Lieutenant Colonel Nachrowi told Jakarta Post the raids to quell the secessionist movements in Aceh will continue unless the president issues a decree to lift the civil emergency and assign us to merely play a humanitarian role in Aceh.” At the same time, the Presiden Susilo Bambang Yudhoyono beseeched rebels to end the 30-year conflict and join the forces in rebuilding the region. The Acehnese who lost their homes and relatives were put impossibly hard position, since they became dependent on Indonesian military (the same people that killed and tortured them over the years) to provide them with food, water, and help in looking for the loved ones. Thus, a great deal of unnecessary deaths occurred because of difficulties involved in getting supplies to tsunami victims through the army cordon. At the same time, attention of international media and aid organizations provided an impetus for Indonesian government to resume negotiations in order to permanently end the conflict in Aceh. Due to government's desperate need of international donors' money to rebuild the province, it finally opened up Aceh province for international aid organizations and volunteers. In turn, this increased the awareness of international community of Acehnese plight, leading to growing pressures on Indonesian government to reach peace agreement. Natural resources and human rights abuses are the main themes of the conflict between the GAM and Indonesian government. The lower left corner of the diagram shows the positive reinforcing dynamics of the conflict. Both economic and political incentives exacerbate the intensity of the conflict. This, in turn, gives reason for Indonesian government to better fund its military. At the same time, while both conflicting parties are involved in human rights violation, this serves their political and economic interests. The upper part of the diagram presents an explanation of the negative effects of the tsunami on habitat, population, economy and how these effects resulted in positive outcome of the conflict. Mainly because of the pressures of international community and the need for Acehnese people to return to normal life, the conflict receded. Primarily SUB-STATE. Aceh province holds a special autonomous status in Indonesia. COMPROMISE. An agreement between Indonesian government and Free Rebels Movement (GAM) was reached during 6 day talks in Helsinki , Finland . It was signed on August 15, 2005. The Indonesian government granted a status of special autonomy”, agreed to release GAM prisoners, and offered a number of economic concessions. On the other hand, GAM dropped demands for full independence and agreed to hand over 900 weapons for destruction. So far, the process has been successful with no signs of backing out by either side. With oil prices rising precipitously, the level of strategic importance of peace in Aceh is higher than ever before. Hopefully, the international interest in Aceh's affairs would preclude conflict from regress. As of November 19, 2005, the rebels handed over 570 weapons. In return, the government withdrew over 2,000 insurgents (the Indonesian military and police force). The overt violence has been stopped in Aceh. In the face of tragic events in Indonesia, such as earthquake and bird flu, the main focus for the government is to facilitate the return to the normal life. Noah Just like in this case, despite the devastation that the flooding of the Nile incurred, it contributed favorably to the region's fertility. Jayamine (Irian Jaya Mine and Conflict) for its' relation to the region (West Papua , Indonesia ) and involved parties (Indonesian military, people of West Papua ). This case is also closely related for its emphasis on human rights abuses of the civil population and the scope of international attention. Ogonioil ICE(Nigeria Pertrolium Pollution in Ogoni Region) is related because of its similar dynamics of conflict and sources of grievances: devastation of the farming land by oil/gas-hungry multinationals, underemployment of local workers, military involvement, civilian murders and tortures, etc. Chechnya (Chechnya Conflict and Environmental Implications) is related because of several similarities between the conflicts in Aceh and Chechnya : muslim population, strive for independence, richness in natural resources, dire human rights violations, and top military unwillingness to stop the conflict due to their gains from the conflict. Sudansanction (The Civil War in Sudan: the Human Price of Oil), Ecuador (Ecuador Oil Exports), Azeroil (Azerbaijan Oil Consortium), and Russoil (Khanty Mansi Oil Development), are somewhat related due to the similar conflict undertones, such as strong dependence of these regions on natural resource extractions and ethnic violence. Aceh (The Acehnese Resistance Movement and Exxon Mobil). It is directly related to the topic of my case, since it addresses the very same population, region, and environmental problems; however, from a different angle. Peten (Guatemala-Maya Civil War) and ICE Case No. 26– Tupac (Tupac Amarau Uprising and Environment) are both related in a sense that just like in my case, military actions provoked civilian support and sympathies towards rebels movements. (9)Technical Report Prepared by BAPPENAS"INDONESIA: Preliminary Damage and Loss Assessment, the December 26, 2004 Natural Disaster", The Consultative Group of Indonesia, January 19-20, 2005. (10) Human Rights Watch, "Indonesia: The War in Aceh", Vol. 13, No. 5 (C). Hagmann, T. 2005. Confronting the Concept of Environmentally Induced Conflict.” Peace, Conflict and Development: Issue Six, January 2005. Barron, P., K. Kaiser, M. Pradan. 2004. Local Conflict in Indonesia : Measuring Incidence and Identifying Patterns.” World Bank, (July 2004). ICG. 2001. Indonesia : Natural Resources and Law Enforcement.” International Crisis Group: Jakarta/Brussels. ICG. 2003. Indonesia : Managing Decentralization and Conflict in Indonesia .” 44. International Crisis Group: Jakarta/Brussels, ICF Asia Report, (18 July). Wilson, C. 2001. Internal Conflict in Indonesia : Causes, Symptoms and Sustainable Resolution.” Parliament of Australia . Research Paper 1 2001-2002. Available at http://www.aph.gov.au/library/pubs/rp/2001_02RP01.htm: Canberra . Indonesia at a Crossroads. 2004. A Survey by The Economist, (December 11 th -17 th ). http://www.fas.org/irp/crs/RS20572.pdf CRS Report to Congress "Indonesian Separtist Movement in Aceh"
http://www.hrw.org/reports/2001/aceh/ Human Rights Watch Publications "Indonesia and the War in Aceh"